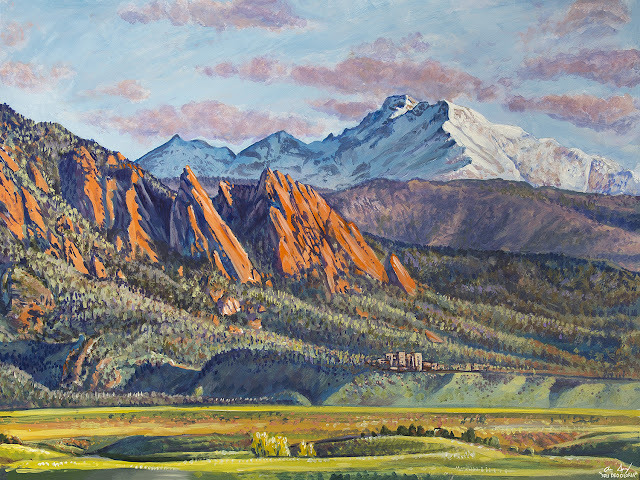 This painting is the latest in a series of artworks depicting classic views of some of Colorado's highest peaks. The view here is from near the city of Boulder looking toward the jagged foothill rock formations known as the Flatirons (center/left). Above is the towering 14er Longs Peak and Mt. Meeker in Rocky Mountain National Park. Below and to the right of center you can see the National Center for Atmospheric Research buildings contrasting the giant landmarks. It was a fun process that took approximately 10 hours. These iconic mountains are special to me and symbolize our home in the Front Range.